When it comes to breakfast, I love to have it all: hot, cold, savory and sweet. It doesn’t matter as long as I have enough time to relish the first and most important meal of the day with no rush. I can get equally excited about a big hearty breakfast with my family or about quickly whipping up some French Crêpes for two – I love it all! I once participated in a workshop on the five elements food philosophy which originated in far Eastern countries like China. People there believe that the first meal of the day is best consumed warm, since our digestive system cools down during the night and therefore requires a (warm) jumpstart to re-stimulate our digestion. Soon I will dedicate an entire blog post to the five elements food philosophy, but for now I’ll share my breakfast recipe with you. It is warm, sweet, nutritious and simply tasty – and it perfectly corresponds with the five elements food cuisine. 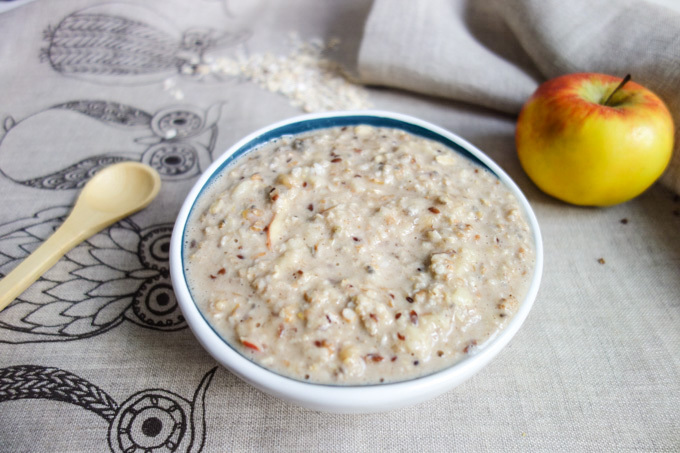 This easy to make vegan oatmeal with apple and banana is just the right blend of sweet and sour, plus it feels like a heavenly comfort food while being an overall healthy breakfast. Pour the milk in a small pot, add the oats and start warming it over medium heat. Grind the apple and add it to the pot along with the cinnamon and cardamom. 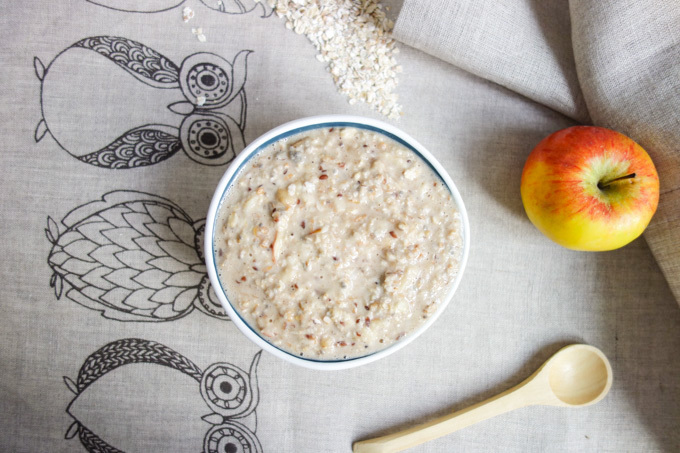 Gently stir and cook the oatmeal until it becomes smooth. In the meantime, mash the banana. Then place the warm oatmeal in a bowl and combine it with the banana and the remaining ingredients. Enjoy while still warm.